VANCOUVER, B.C. 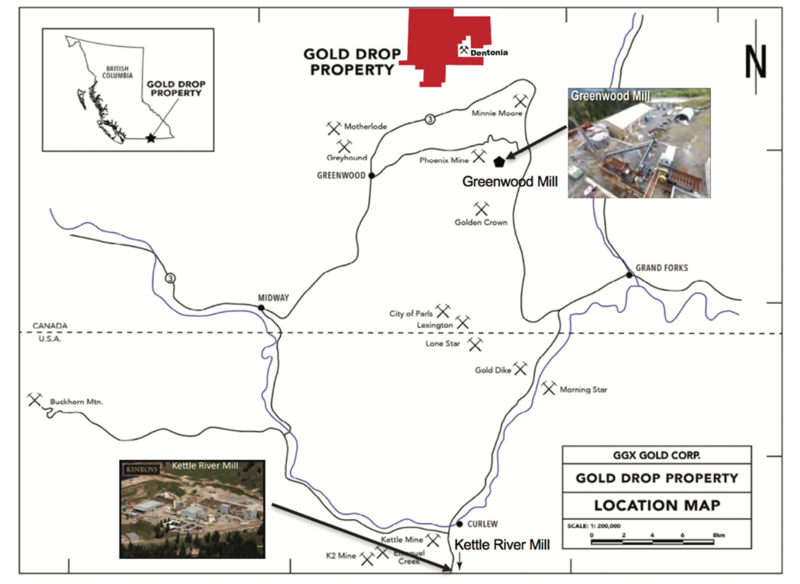 / ACCESSWIRE / January 14, 2019 - Ximen Mining Corp. (TSX.V: XIM) (OTCQB: XXMMF) (the "Company" or "Ximen") is pleased to provide an update on the Gold Drop Property which is currently under option agreement to GGX Gold Corp. (TSX.V: GGX) and located near Greenwood in southern British Columbia. 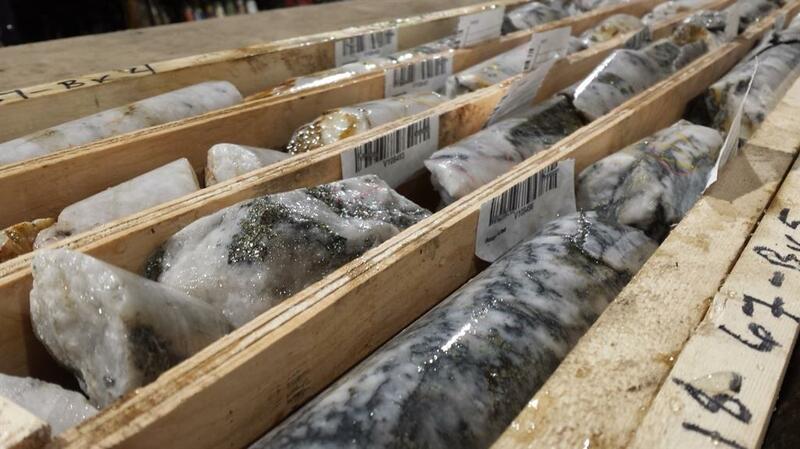 Ximen´s option partner has announced diamond drill core analytical results for the first 7 of the 11 diamond drill holes completed, COD18-61 to COD18-67 from the November 2018 diamond drilling program on the COD Vein southern extension (GGX News Releases of January 9, and 11, 2019). 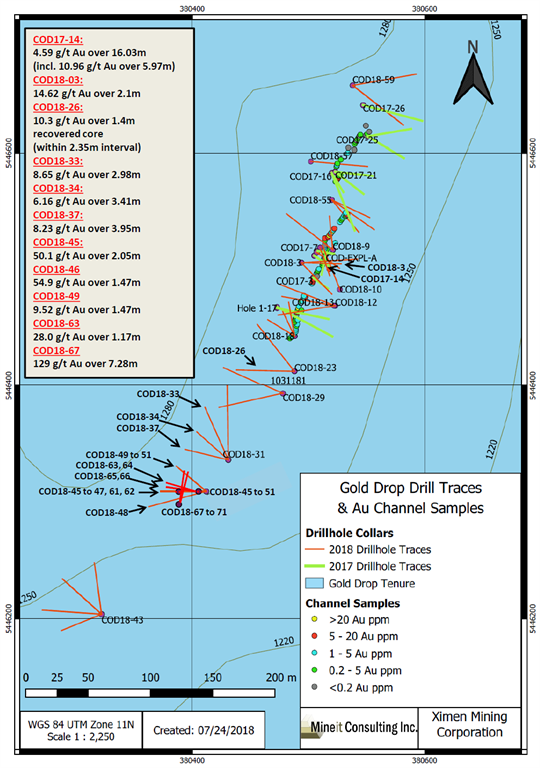 The recent analytical results are highlighted by a 7.28 meter interval which returned 129.1 g/t gold and 1,154.9 g/t silver in drill hole COD 18-67. - COD18-45 intersected of 50.1 grams per tonne (g/t) gold and 375 g/t silver over 2.05 meter core length including 167.5 g/t gold, 1,370 g/t silver and >500 g/t tellurium over 0.46 meter core length (GGX News Release of August 15, 2018). - COD18-46 intersected 54.9 g/t gold and 379 g/t silver over a 1.47 meter core length, including 223 g/t gold, 1,535 g/t silver and greater than 500 g/t tellurium over a 0.30 meter core length (GGX News Release of August 22, 2018). Intersections exceeding 1 g/t gold for drill holes COD18-61 to COD18-67 are listed in the table below. Since true widths cannot be accurately determined from the information available the core lengths (meters) are reported. Quartz veinlet & altered wall rock. Holes COD18-61 to COD18-67 were drilled to the west and slightly northwest at dips of 45 to 60 degrees to intersect the approximately northeast striking COD vein.